Shoulder pain remains one of the main reasons to consult a physician or physiotherapist today, with up to one-quarter of the Western population reporting a shoulder problem at any one time. Among shoulder disorders, a rotator cuff (RC) tendinopathy remains the leading source of shoulder pain. 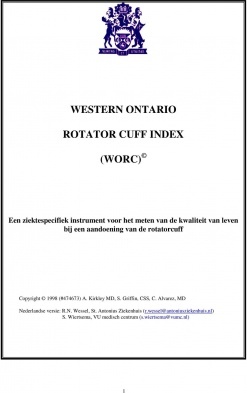 The Western Ontario Rotator Cuff (WORC) Index is a questionnaire that was purposely developed to help understand the particular signs, symptoms, and functional limitations associated with an RC tendinopathy. It is an Outcome Measure used by clinicians to evaluate the condition of individuals affected by this pathology. It can help establish goals, prognostic indicators, and an overall rehabilitation plan for individuals affected by an RC tendinopathy. the WORC Index, is a disease-specific quality of life questionnaire, evaluating the change in symptoms and functional ability, specific to a RC tendinopathy. This questionnaire has been used with individuals with a clinical diagnosis of an impingement syndrome, RC tendinopathy as well as arthroscopic RC repairs. The WORC Index is a self-administering health questionnaire. Each question uses a visual analogue scale (VAS) - which is a straight line, representing a 100-point scale, ranging from 0-100. The maximum score is 2100 (worst possible symptoms). Zero (0) represents no symptoms at all. To make the final score more clinically friendly, some minor math is involved. The score can be reported as a percentage by subtracting the total from 2100, dividing by 2100, and multiplying by 100. This will give you an overall percentage. Total final WORC scores can, therefore, range from 0% ( lowest functional status level) to 100% (the highest functional status). Scoring: Using the VAS, measure the distance from left to right, along the line. The total score is out of 100 (record the value to the nearest 0.5mm). Final Score - 2100 (max) / 21, x 100%. For example: A score of 1625. (1625/2100)/21 = 22.6% (therefore, overall low functional status). The usefulness of a tool in a clinical setting depends on how much the clinician can rely on the data and how stable the data is over time. A good tool will have strong reliability, validity, and will be responsive to change. Reliability refers to how consistent the tool is at measuring your outcome of interest, and is it free of error. The WORC Index is highly reliable and has an excellent test-retest reliability (intraclass correlation coefficient) ranging from 0.85-0.99. The WORC Index also has a standardized response mean (SRM) of >1.3. Validity means that the tool is measuring what it is intending to measure.7 In the case of a questionnaire, often times they are compared to questionnaires that are already validated with the population of interest. The WORC Index was found to be highly correlated t the DASH questionnaire (r=0.78) and moderately correlated with the SF-36 (r=0.68). Responsiveness can best be understood as the ability of an instrument to detect clinically important changes. When compared to other upper-extremity questionnaires (DASH, UEFI) or shoulder specific questionnaires (SPADI, ASES, SST), the WORC Index systematically demonstrated higher responsiveness among individuals with an RC tendinopathy. The WORC Index sports a Minimally Clinically Important Difference (MCID) of 245 points of the total score, or 11.7% (11.7 points on the scaled index with maximum value of 100). This is the amount of change in the results of the final score of the questionnaire, that can be said to be clinically important (an important change for the patient). An interested study by Wessel and colleagues (2018) found that patients undergoing a RC repair needed to improve more than 35 points to see a clinically important change. The WORC Index has a high responsiveness with patients undergoing rotator cuff repair and patients with an RC dysfunction, without an RC tear. The WORC Index is used in research and has already been translated into Canadian French, German, Iranian, Norwegian, Portuguese and Turkish. Because of it's language versatility, it is a good tool to use for international studies and comparisons. For more information on the subject, you can look into the Western Ontario Shoulder Tools (WORC, WOOS, WOSI)! Did you know that a Short Form version (7-times) of the WORC Index (Short-WORC) is up and coming? For more information, click here! Where did it all begin? 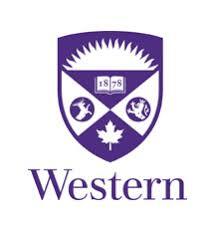 Western University, in London, ON Canada. Check it out! Are you looking for more on this Outcome Measure? Happy reading! If you are curious about other Outcome Measures for the shoulder, check out this short video! For a comprehensive list of Outcome Measures, you can consult the Orthopaedic Score Home page. Happy reading! ↑ Luime JJ, Koes, B.W., Hendriksen, I.L., et al. . Prevalence and incidence of shoulder pain in the general population, a systematic review. ''Scand J Rheumatol.'' 2004;33:73-81. ↑ Chard MD, Halzleman, R., Hlazleman, B.L., King, R.H., & Reiss, B.B. Shoulder disorders in the elderly: a community survey. ''Arthritis Rheum.'' 1991;34(6):766-769. ↑ van der Windt DA, Koes, B.W., de Jong, B.A., & Bouter, L.M. Shoulder disorders in general practice: incidence, patient characteristics, and management. . ''Ann Rheum Dis.'' 1995;54(12):959-964. ↑ Arcuni SE. Rotator cuff pathology and subacromial impingement. ''Nurse Pract.'' 2000;25(5):58-66. ↑ Anderson VBW, E. . Impaired joint proprioception in higher shoulder elevations in chronic rotator cuff pathology. . ''Arch Phys Med Rehabil'' 2011;92:1146-1152. ↑ Holtby R RH. Measurement properties of the Western Ontario rotator cuff outcome measure: a preliminary report. ''Journal of shoulder and elbow surgery/American Shoulder and Elbow Surgeons.'' 2005;14(5):506-510. ↑ Portney LGW, M.P. ''Chapter 5: Reliability of Measurements.'' 3rd ed. ed. Philadelphia: F.A Davis Company. ; 2015. ↑ 8.0 8.1 8.2 8.3 St-Pierre C, Dionne, C.E., Desmeules, F., & Roy, J.S. Reliability, validity, and responsiveness of a Canadian adaptation of the Western Ontario Rotator Cuff (WORC) index. ''Journal of Hand Therapy.'' 2015;28(3):292-298. ↑ 9.0 9.1 St-Pierre C, Dionne, C.E., Desmeules, F., & Roy, J.S. Reliability, validity, and responsiveness of a Canadian adaptation of the Western Ontario Rotator Cuff (WORC) index. ''Journal of Hand Therapy.'' 2015;28(3):292-298. ↑ Kirkley A, Alvarez C, Griffin S. The development and evaluation of a disease-specific quality-of-life questionnaire for disorders of the rotator cuff: The Western Ontario Rotator Cuff Index. ''Clinical journal of sport medicine : official journal of the Canadian Academy of Sport Medicine.'' Mar 2003;13(2):84-92. ↑ Harris JD, Pedroza, A., & Jones, G.L. Predictors of pain and function in patients with symptomatic, atraumatic full-thickness rotator cuff tears. ''Am J Sports Med.'' 2012;40(2):359-366. ↑ Wessel RN, Wolterbeek, N., Fermont, A.J.M., Lavrijsen, L., van Mameren, H., & de Bie, R.A. Responsiveness and disease specific of the Western Ontario Rotator Cuff Index. ''Journal of Orthopaedics.'' 2018;15(2):337-342. ↑ Razmjou H BA, van Osnabrugge V, MacDermid JC, & Holtby R. Cross-sectional and longitudinal construct validity of two rotator cuff disease-specific outcome measures. ''BMC Musculoskeletal Disorders.'' 2006;7(26). ↑ Huber W HJ, Hanslik-Schnabel B, Posch M, & Wurnig C. [Translation and psychometric testing of the Western Ontario Rotator Cuff Index (WORC) for use in Germany]. ''Zeitschrift fur Orthopadie und ihre Grenzgebiete.'' 2005;143(4):453-460. ↑ Mousavi SJ HM, Abedi M, & Montazeri A. Translation and validation study of the Persian version of the Western Ontario Rotator Cuff Index. . ''Clinical Rheumatology.'' 2009;28(3):293-299. ↑ Ekeberg OM B-HE, Tveita EK, Keller A, Juel NG, & Brox JI. Agreement, reliability and validity in 3 shoulder questionnaires in patients with rotator cuff disease. . ''BMC Musculoskeletal Disorders.'' 2008;9(68). ↑ Lopes AD CR, Carrera EF, Griffin S, Faloppa F, & Dos Reis FB. . Validity and reliability of the Western Ontario Rotator Cuff Index (WORC) for use in Brazil. ''Clinical journal of sport medicine : official journal of the Canadian Academy of Sport Medicine.'' 2008;18(3):266-272. ↑ El O BC, Gulbahar S, Demiral Y, Sahin E, Baydar M, Kizil R, Griffin S, & Akalin E. The reliability and validity of the Turkish version of the Western Ontario Rotator Cuff Index. ''Rheumatol Int.'' 2006;26(12):1101-1108. ↑ Kirkley A GS, & Dainty K. Scoring systems for the functional assessment of the shoulder. ''Athroscopy.'' 2003;19(10):1109-1120.